Charles Clemens “Doc” Cunnick, 92, of McPherson, Kansas, passed away at 5:12 a.m., Tuesday, June 19th, 2018 while in the company of family members, at Cedars House. Doc was born in Davenport, Iowa on May 3, 1926, a son of Estelle M. (Strahm) and Paul Carrolton Cunnick. Doc attended Pierce Elementary School, Sudlow Jr. High and graduated from Davenport High School, Davenport, Iowa in 1944. He joined the United States Navy during W.W. II and honorably served his country until his discharged in 1946. He then attended University of Kansas, Lawrence, Kansas where he received his BS and MS degrees in Microbiology. He attended medical school and taught Microbiology at Kansas City Osteopathic Medical School, Kansas City Missouri. He served his internship and taught Microbiology at Kirksville College of Osteopathic Medicine, Kirksville, Missouri. He was a member of St. Joseph’s Catholic Church McPherson, where he was a member of the Knights of Columbus. 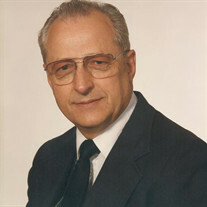 Doc started working for Jen-Sal Biologicals, was a Sales Representative for Geigy a Pharmaceutical Manufacturer, Microbiology professor, and practiced medicine in McPherson from 1972 to 1995 along with his wife who helped in the office, served as a McPherson County Coroner from 1978 to 2002, and was the Physician for the McPherson County Jail for many years. Doc was a member of the American Osteopathic Association, Kansas Osteopathic Association where he served as President for a year, tutored through Big Brothers, and served his community through the years in many other capacities. Doc enjoyed gardening, traveling with his family and brother, mentoring, driving his camper, camping, carving, woodworking, and reading, especially westerns. Charles C. “Doc” Cunnick was united in marriage to Gloria Kathryn Angotti on November 7, 1953 at Holy Trinity Church, Kansas City, Missouri. The young couple established their first home together in Kansas City, Missouri. The family moved several time until settling in McPherson, Kansas in 1972 where he started his medical practice. He is survived by his loving and devoted wife of over sixty-four years Gloria Cunnick, of McPherson, Kansas; his children, Jess Cunnick and wife YoungJin Cho, of Scranton, Pennsylvania, Joan Cunnick and husband Mark Clipsham, of Ames, Iowa, Mary Tinsley and husband Mark, of Columbus, Ohio; Paul Cunnick and wife Cecilia, of McPherson, Kansas, Rachael Cunnick, of Albuquerque, New Mexico, John William Cunnick, of Oxnard, California, Sarah Cunnick, of Manhattan, Kansas and Leah Cunnick, of Manhattan, Kansas; his sister-in-law, Isabella Angotti of North Kansas City, Missouri; his six grandchildren, Max Cunnick, Kathryn Cunnick, Zachary Clipsham, Maia Clipsham, Justin Cunnick, and Christian Cunnick; several nieces and nephews and other relatives. Doc was preceded in death by his parents; and his brothers, John and Paul Carrolton Cunnick. Visitation will be held on Friday, June 22, 2018 from 5:00 p.m. to 7:00 p.m. with Rosary at 7:15 p.m. at St. Joseph’s Catholic Church, McPherson. A Mass of Christian Burial will be celebrated at St. Joseph’s Catholic Church, McPherson, Kansas, at 11:00 a.m. on Saturday, June 23rd, 2018 with Fr. Ben Shockey officiating. Burial will be held in the Pine Hill Cemetery Davenport, Iowa. In lieu of flowers, memorial contributions may be made to St. Joseph’s Catholic Church or Kansas City University of Medicine and Biosciences and they can be sent in care of the Glidden – Ediger Funeral Home; 222 West Euclid Street; McPherson, Kansas 67460.